Update: Making Waves is now known as Manitoba Swimability. 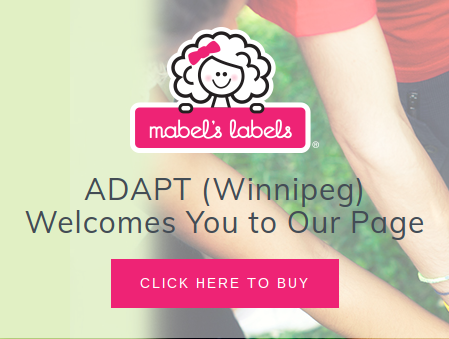 Information can be found at www.manitobaswimability.org. Our kids love water play. Especially at the lake. In fact, our daughter won’t come out – she so enjoys the feel of the water as she bounces and splashes. Two summers ago, we noticed she really had no fear. If we weren’t nearby, she would walk out into the lake as far as she could before we caught up. In the hotel pool, she kept trying to bounce into the deep end. While we wanted to encourage her love of water play and swimming, we also were concerned for her safety. So that fall, I registered her in public swimming lessons – only to find the whole experience was rather overwhelming. It wasn’t anyone’s fault, but I had to withdraw her from that session. Soon after that, I heard about Making Waves Winnipeg. It’s a volunteer organization that connects high school and college students with children with disabilities, in order to teach them to swim. 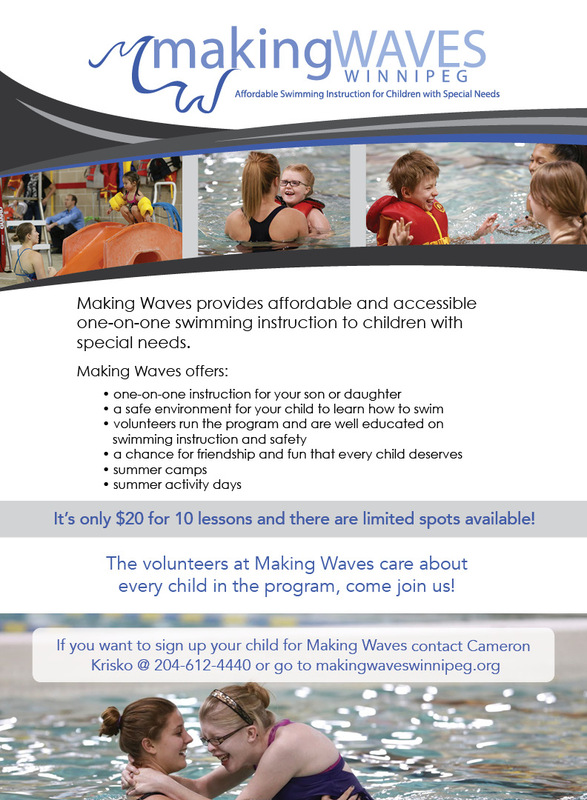 Making Waves Winnipeg is a chapter of Making Waves Canada, a not-for-profit organization formed with the goal of changing two statistics: drowning is the second-most common cause of accidental death for children, despite a significant increase in general swimming proficiency in North America. A separate study found that disabled children are ten times likelier to suffer from a submersion injury, compared to the general population. (Making Waves website). Children with autism (and with other disabilities) often need a different sort of instruction in swimming: understanding and following directions can be difficult, attention spans may be short, the sensory environment may be especially distracting, and the child may have greater than usual difficulty learning motor skills. Making Waves assigns instructors to students in a 1:1 ratio, and also does some training to help the instructors understand the unique needs of our children. The lessons are sequenced and paced in response to our kids’ abilities. Another reason it really worked for us is the warm, playful relationships developed over the course of ten weeks (or longer – our kids have been rematched with previous instructors). First priority was helping our kids feel comfortable in the water (not really a problem for us) and also in the teacher/student relationship (which was more of a challenge). My daughter liked to hug her teacher every week. So they weren’t just learning to swim – they were building social skills in a guiding relationship as well. And of course they’re learning to swim too! It’s been a great experience. The leaders are organized and very friendly, the teachers who have worked with our kids are enthusiastic, kind, and patient. It’s fun to see our kids enjoying the water and being taught at a pace that fits them. It’s also fun to see all the other kids learning to swim and happily interacting with their instructors too. We’ve even met a few other parents, and been reminded that we’re all here working on the same goals. Making Waves Winnipeg starts up again in September. It offers half-hour lessons on Saturday afternoon/evenings. The cost per child is just $20 per season, which covers a part of the pool rental and also pays the salary of a lifeguard, who is always on duty during classes. 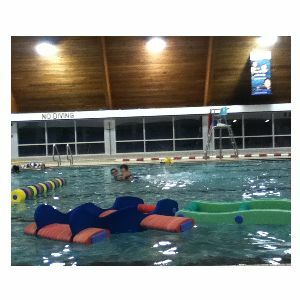 Making Waves classes are held at Seven Oaks Pool, located at 444 Adsum Drive in Winnipeg, Manitoba. There are two seasons of lessons per year: the fall season of lessons runs from September – December while the winter session runs from January – April. Also worth considering: Making Waves is always looking for young people who would be willing to donate their time to help teach kids to swim. Making Waves also gladly accepts donations to help cover additional costs. They also have a yearly Golf Tournament to raise funds in August – they are looking for sponsors, players and prizes! If you can contribute any of those, your help would be very welcome! You can read more or contact Making Waves at makingwaveswinnipeg.org. Also, check out this article in the Winnipeg Free Press.